My dad is an engineer who grew up during the golden age of electronics, and who infused me with a considerable portion of my geekiness. He is a great go-to person for questions on almost any topic. He is the king of Trivial Pursuit. When my husband and I were dating, I said to him, “Watch this.” Then, I said to my dad, “What does DNA stand for?” Without missing a beat, he said, “Deoxyribonucleic acid” (I had to look up the spelling). He was great to have around while struggling with homework. No math question was ever too difficult for him, no matter how difficult the math got. He tutors to this day. My husband once said it was like growing up with Doc Brown from Back to the Future as Dad. While I was on vacation this week, we were going through some old pictures when I came across his old ham radio cards, or QSL Cards. I didn’t happen to think to take any pictures of them, but I found one in the Internet so you can see what I’m talking about. Unfortunately, my father no longer has any of his own QSL cards. He started telling us this story of how he got his ham radio license when he was fifteen, and how he built his own ham radio transmitter out of vacuum tubes and spare parts with the help of a retired Navy chief who lived just down the street. It is a fun story, and more details come out every time he tells it. I never heard about the Navy chief before this particular telling. Fast forward a few days. Out of the blue, my mother asks my dad if something can be done about their old 8mm home movies. Can they be made into DVDs? Then, he starts talking about the projector, which is still in the garage. It hasn’t worked since the early ’70s. Mom tells him to go get it, and he dutifully brings it into the kitchen, and pulls it out of the box, along with about a dozen film reels. It’s a Kodak Brownie 8mm Film Projector. It’s dusty and made of metal, and is very retro-looking. A lot of unidentifiable dust comes out along with it, which my mother says is roach poop. There’s at least one dead silverfish. Dad opens the front and the back, looking for the power cord, then he stops, puzzled, because it’s not there. “There it is!” I said, pointing to a stub of a power cord poking out the front, where this one is. Not our projector. Click to zoom. At this point, we all think that the projector is junk. I mean, when an electrical gadget has no cord, that’s it, isn’t it? 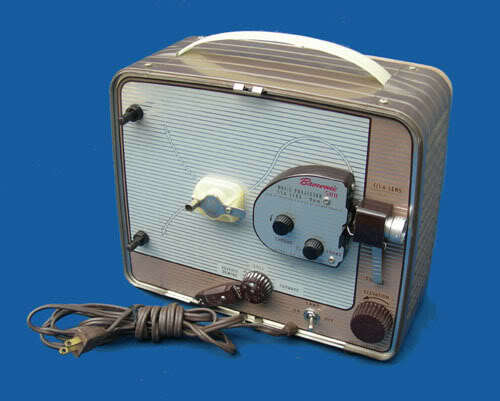 I go to the computer and start googling “brownie 8mm projector”. I even find one for 40 bucks, minus a lamp. My mom comes in and sidetracks me by having me price Irish crystal. You know, girly stuff. We’re in there for about 20 minutes. Anyway, he hooks up the other end of the speaker wire to a plug that he just happens to have. I mean, we all have plugs handy in our tool box, don’t we? Then, he peers at it, dissatisfied. The plug, he pronounces, is unsafe. He rips it apart, and goes out and gets a mac-daddy, supersafe plug. That he happens to have. At this point, we’re all just waiting for him to plug the danged thing in. 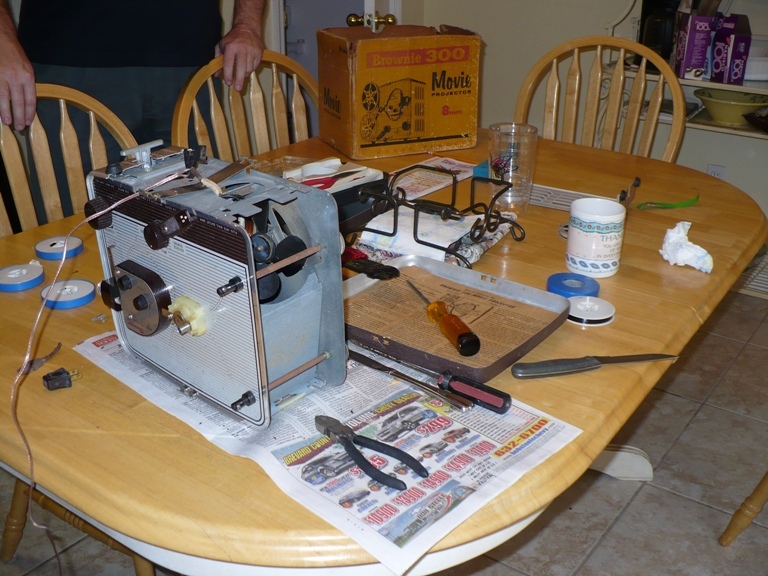 He reassembles the safe plug, and then, just like Doc Brown, he apologizes for the crudity of his operation. He didn’t have time to get a proper power cord, yanno, or splices or grommets. I take on the role of Michael J. Fox, and I tell him that it’s fine. Time for the first test. It will only smoke a little, he tells us, if there is something wrong with the electrical aspects of it (whatever they are). He makes sure it is in the off position, and then without a fear, he plugs it in. Next test: he flips it on. The light shines bright and after a bit of sluggishness — entirely understandable because it’s been in a box for 38 years — the danged motor starts to move. Next test: an actual movie. We didn’t have a return reel, so we played an old Woody Woodpecker silent cartoon. A vaguely familiar electrical smell filled the room while husband held up a pillowcase to act as a projector screen, and we watched it upside down (it wasn’t safe enough to turn upright yet). As it played, I hand-fed the film into a coil, which we tied off and set aside. Presto. The empty reel is now a return reel. 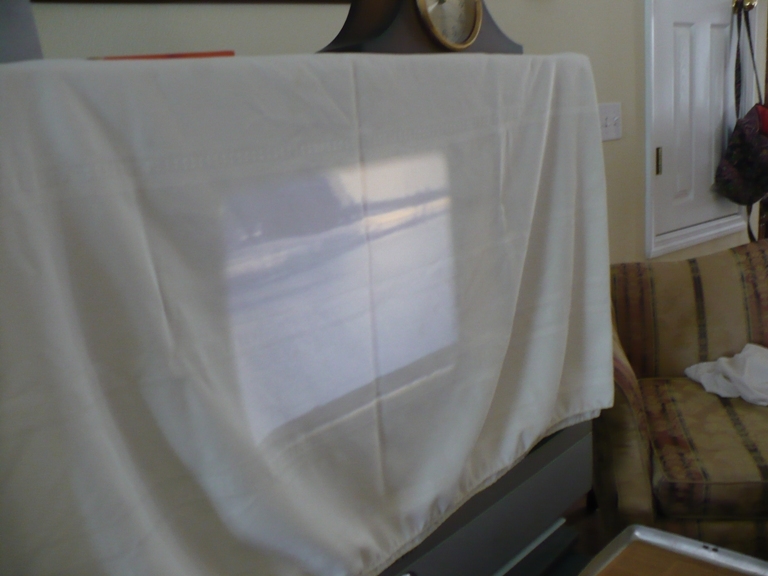 Yes, that’s a flatscreen TV that we are projecting it onto, covered with a folded sheet. There’s something poetic about using a flatscreen TV as a projector screen for an 8mm movie, but I’m not sure what it is. Sorry so blurry. Click to enlarge. It’s on an ironing board, because of it’s height-adjustable features and the fireproof cloth cover. Never mind the newspaper. Since I have the only movie projector screen in the family, we plan to have a get-together where he will bring the projector (cleaned up and with the proper power cord, or course), all the movies and all the slides (yes, he has those too, but I have the only slide projector), and we will show them to the entire family for the first time in almost 40 years. Now that will be worth another blog post. So cool! 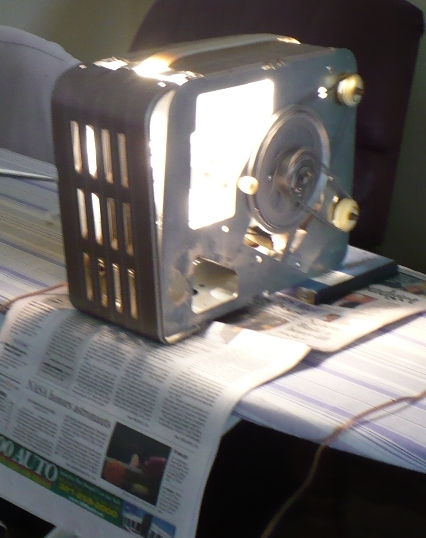 My dad resurrected an old reel-to-reel a few years ago and we listened to old tapes. Loved it! 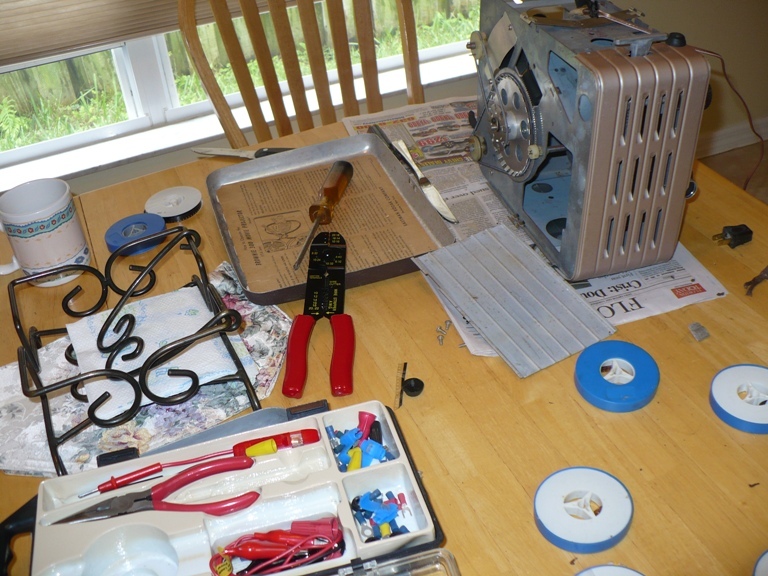 My husband bought a reel-to-reel years ago, and it we had it in our first few apartments. It had such a sensitive auto-reverse that you barely heard a click if it had to reverse in the middle of the song. What a fun adventure! And I can’t decide if it would be cool or not to grow up with a dad like Doc. Awesome! It was definitely cool. Especially when tackling advanced math. Not that I got all that advanced, but some of my sisters did. I was on my own with advanced English, though. I just love time traveling! I do it whenever I get the chance! Awesome story. Your dad sounds like a fun guy to be around. It should be fascinating to view those old movies and slides. I can relate to this one on a couple of levels. When I was a child, I used to watch him fix our TV. He would change out vacuum tubes and degauss the screen with a sci-fi looking coil. He would help me and my friend Dave with all of our crazy experiments and inventions. I also started adding some articles to encourage kids to pursue Engineering and Science. My next article will be to encourage girls to consider Engineering. My dad worked for the guys that built the Monorail at Disney. No, he wasn’t involved with the monorail project. But they had a mockup of the monorail in front of their building for as long as we lived in Orlando. I was the only one of five kids who went into an engineering-esque field. I had a 12th grade math teacher who wanted me to go into engineering. I told her of my ho-hum grade point average, but she was still confident I could get a certain scholarship, especially since she was willing to recommend me. I had no idea why she chose me; I didn’t manage to get A’s most of the time in her class. But I guess I did well enough. Of course, she was right. Years later, I was programming in C++. I loved your degaussing story! My father never did anything like that, but he had a working ham radio receiver all the way up to the 70s. She must’ve seen your potential. Grades so often aren’t an indication of what kids can actually do. Nice to hear of a teacher encouraging someone to challenge herself despite the ho-hum grades. Tia, what an awesome telling of that story! I admit that I shed a little tear reading about my awesome dad. It didn’t surprise me in the least when I came over Friday and he had gotten the projector working, of course he he could do that, he was Dad! This is the same man that concocted an elaborate Halloween costume for himsel and Mom of a light plug and light socket, out of a couple of cardboard boxes and some electrical parts. Can’t wait for the viewing party! Let me know when! Oh, yes. The naughty Halloween costume. That just goes to show that children will only see the innocence in things, and then years later, they appreciate the naughty. We had a grand old time. I told dad I’d clean up the projector with alcohol when he brings it over.